Retrofits the existing mounting hole to replace the Ritchie Helmsman Models HV-76 and HV-77 with the SR-2 and SS-PR2. 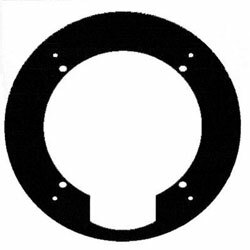 Requires 4 non -Magnetic # 6 flathead screws (not included) to mount the Adapter Plate to a Bulkhead. The SS-PR2 and SR-2 mounts to the Adapter Plate using hardware supplied with the compass.